The image shows a carrier board from Sparkfun. 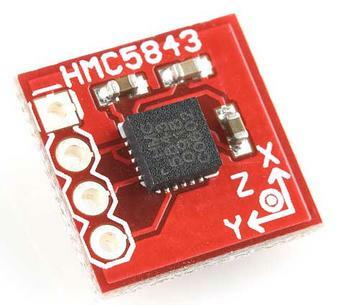 This compass is accessed over I2C at address 0x3C. Since the device is really a magnetometer then the floating point maths library is used to calculate the bearing, roll and pitch in degrees. HMC5843_1Hz - Changes the default refresh rate to once per second. HMC5843_2Hz - Changes the default refresh rate to twice per second (every 500ms). Changes the default refresh rate to once per second. Changes the default refresh rate to twice per second (every 500ms).